Bhutan, Land of the Thunder Dragon: Wild Women Expeditions, a pioneer in women-only travel adventures, is introducing Spirit of Bhutan on three 2018 hiking departures. CORNER BROOK, NL, CANADA – Imagine a country that places happiness above all else, where every policy must pass a Gross National Happiness filter to be enacted. Imagine trekking through lush green mountainous valleys of a remote Himalayan kingdom where yak herders greet you with smiles as the chanting of monks echoes from ancient cliff-side monasteries and colorful prayer flags ripple before snow-capped peaks. Welcome to Bhutan, Land of the Thunder Dragon. A company devoted to active travel adventures designed for women only presents for 2018 its brand-new itinerary in this distant land that time – almost – forgot. Wild Women Expeditions, the pioneer in women-only travel adventures, introduces Spirit of Bhutan on three brand-new 2018 hiking departures: Sept. 20-Oct. 2, Oct. 11-23 and Nov. 12-24. 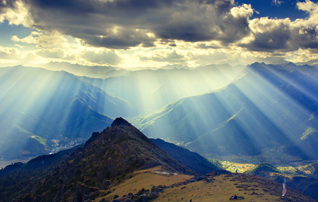 Only over the past 50 years have visitors been allowed to visit Bhutan, land locked in the Himalayas between Tibet and China to the north and India to the south. It is still also time locked, only early in the 21st century opening to Western influences. Bhutan, despite the encroachment of the internet and hand-held devices, remains steeped in ancient traditions with overlays of powerful Buddhist mythologies. How spirituality and myth translate into 21st century life in this 750,000 population is a focus of Wild Women Expeditions’ quest. “Bhutan is a shining example of how spirited adventure tourism can be truly sustainable,” underscored Jennifer Haddow, visionary Owner/Director of Wild Women Expeditions. “Bhutan’s commitment to being a carbon neutral country comes to life in its approach to tourism, where travelers take great care to minimize their footprint on this wilderness Shangri-la.” She personally researched and helped craft this tour of west and central Bhutan — with the highest standards of ecotourism at heart. The per person rate is $4,495 inclusive of ground transportation, including airport transfers; 12 nights accommodation (lodges, inns, a luxury resort and one night camping); meals throughout the trip; services of an experienced Bhutanese English-speaking female guide and of porters; camping equipment for a hiking expedition to Tiger’s Nest; entry fees and permits; and domestic air fare from the gateway, Paro, one way to Bumthang, the spiritual heartland of Bhutan. Visits to monasteries or dzong perched on cliffs overlooking traditional rural life reveal that these fortress-like cloisters historically served as lighthouses, sending warning signals against potential marauders. An afternoon of river rafting coincides with a visit to the imposing Punakha Dzong (Palace of Great Happiness). Built in 1637, it is strategically placed at the confluence of two rafting rivers (Po Chu and Mo Chu). Guests also visit Taktshang (Tiger’s Nest) whose lore and location epitomize Bhutan’s spirituality and beauty. One day guests walk for several hours through a forest of rhododendron and hemlock to meet some 30 nuns in contemplation and seclusion at one of the oldest (early 9th century) of seven nunneries in Bhutan. Guests can anticipate walking up to16km on mountain pathways through blue pine and juniper forests. One trek leads to Bumdra Monastery and a meadow laced with chortens (stupas) and prayer flags. Here women camp under the stars with a nearby 4,000m peak beckoning the hearty. Each glimpse of a dzong brings high-altitude vistas of mountains gouged by deep river valleys and rice fields, together comprising the country’s 60 percent of land designated national parks and wildlife sanctuaries. Forests covering over 70 percent of the landscape are themselves resources. For example, guests visit a family-owned incense factory that utilizes juniper, rhododendron and cypress to make incense. They are served tea during another family visit; they experience the restorative properties of a hot stone bath followed by a lesson in Bhutan’s national sport, archery. A day trip to Thimphu, Bhutan’s capital, features the weekly market and revered Memorial Chorten that underscores the importance of the country’s two-party constitutional monarchy. The Changangkha temple, since the 12th century overlooking Thimphu, is a study of devotees flocking here to circumambulate and turn the prayer wheels. The temple contains beautiful wall paintings and hundreds of religious scriptures written in gold. A huge golden statue of Buddha Dordenma commands a view of the valley. His three-story throne holds several chapels; the body itself is filled with 125,000 smaller statues of Buddha. On an earthly note is a visit to a nearby weaving center where local women create intricate fabric for the traditional Bhutanese garment of gho (for men) and kira (for women). For trip details see https://wildwomenexpeditions.com/trips/spirit-of-bhutan/. 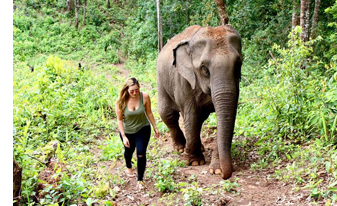 During Wild Women Expeditions’ Elephants, Treks and Temples tour of Northern Thailand participants get to help bathe, feed and walk elephants at both an elephant rescue center and in a Karen tribal village in the jungle. CORNER BROOK, NL, CANADA– Elephants are the stars in a new-for-2018 multi-sport Thailand adventure for women-only hosted by Wild Women Expeditions. Fall 2018 departures of Elephants, Treks and Temples tour of Northern Thailand (http://wildwomenexpeditions.com/trips/thailand-elephants/) will immerse guests for 11 days in the culture and landscape of northern Thailand’s Chiang Mai region on bicycles, and while trekking and coursing down rivers on bamboo rafts. Stops enroute include helping to bathe, feed and walk elephants at both and an elephant rescue center and in a Karen tribal village in the jungle. 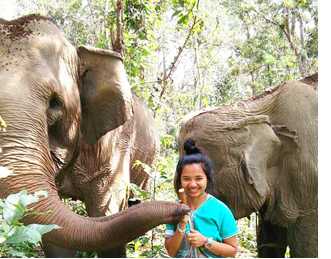 Wild Women Expeditions’ Elephants, Treks and Temples Tour of Chiang Mai, Thailand, provides opportunity to help care for elephants. Wild Women Expeditions has also thrown its financial support behind Chai Lai Orchid and a Go Fund Me Campaign to empower local women and rescue elephants. Donations are needed to save 13 Asian elephants from abusive conditions and to support a human-trafficking prevention program. For more details and to contribute see: https://www.gofundme.com/ChaiLai. Elephants in this region are big business. The animals are enslaved to the tourist trade 365 days a year as cheap transportation carrying the weight of a heavy metal chair plus the weight of humans. Elephants are also in chains to logging interests, day after day dragging felled trees from the jungle. In the rescue center caretakers from a Karen hill tribe assure that the animals are well treated and have access to water for bathing. See: https://www.chailaiorchid.com/elephant-sanctuary/. In Chiang Mai is the world’s first elephant hospital that is supported by a non-profit organization called Friends of the Asian Elephant. Here treatments cover the spectrum of what distressed elephants may require, from illnesses requiring antibiotics to injuries mandating surgeries and future prosthesis, to maternal and infant care. See: http://www.friendsoftheasianelephant.org/en/. The per person double rate is $2,295 USD inclusive of 10 nights accommodation (including a home stay), most meals, services of an English-speaking certified female guide and assistant guides, drinking water and snacks, activity-related equipment, travel, including airport transfers, in private air-conditioned vans, sightseeing tickets and zone entrance fees, flight confirmations and luggage transfers. The coastlines and national parks of Canada are components of three summer wilderness vacations with Wild Women Expeditions. The coastlines and national parks of Canada, celebrating its 150th heritage anniversary in 2017, are components of three summer wilderness vacations with Wild Women Expeditions, the tour company offering more active travel departures for women only than any other operator in the world. Newfoundland Gros Morne (National Park) Multi-Sport Adventure is a seven-day hiking and kayaking expedition that utilizes ocean-side cabins. The $2,295 CAD per person rate includes professional, local female guide(s), all meals, fully outfitted sea kayak day trip on Bonne Bay (think Minke whales, eagles, terns, and kingfishers), guided hikes (think Woodland caribou, Rock ptarmigan and Arctic hare) and walks throughout the park, a Western Brook Pond fjord boat tour, roundtrip transfers from Deer Lake Regional Airport (servicing Toronto) and a park pass. Daily challenges reflect the philosophy that women can discover and build on their own inner strengths by mastering hurdles in the safe company of other women. The first hike in this UNESCO World Heritage Site is 5km with a 500m elevation gain/loss on rugged trails; the second is roundtrip 9km with a 300m elevation gain/loss; an estimated five-hour kayak excursion precedes the third hike, a 16 km, 800m elevation gain/loss trek experienced in over eight hours while climbing Gros Morne Mountain, the highest point in the park at 806m. Easy walks follow in tandem with a catch-your-breath boat tour of a landlocked fjord. This park is as important to Plate Tectonics Theory as Ecuador’s Galapagos Archipelago is to the Theory of Evolution. The challenges of this environment become metaphors for those the women face, hiking first through a barren, nutrient-challenged landscape; then discovering where the peridotite ends and the ancient oceanic crust begins, down through boreal forest to rugged coastline where pillow lava and sea stacks dominate the shoreline; then moving on to the rich marine wonderland of Bonne Bay and a landlocked lake before accomplishing a summit (http://wildwomenexpeditions.com/trips/newfoundland-multisport/). Haida Gwaii Kayak Adventure in Gwaii Haanas National Park Reserve and Haida Heritage Site is a fully outfitted eight-day camping (on beaches) and kayaking expedition at $2,795 CAD per person that includes camping gear, all meals, Zodiac transportation, park pass and the expertise of two certified kayak guides. This National Marine Conservation Area of Canada is north of Vancouver, BC. Here paddlers drift through Haida First Nation waterways, passing ancient totem poles. Black bears mosey among towering trees; sea lions and seals flop at the water’s edge. “You are one with the water. The silence is heavy and heavenly,” said Haddow, adding that water, wildlife and the spirit of the First Nation combine to create a spiritual quest. Routes south and north begin in Sandspit on Moresby Island (serviced by air from Vancouver). Southern route departure is set for Aug. 20-27, 2018. Northern Route departures are Aug. 21-28, 2017, and Aug. 27- Sept. 3, 2018 (http://wildwomenexpeditions.com/trips/haida-gwaii-british-columbia/). Vancouver Island Multi-Sport Adventure in Pacific Rim National Park Reserve is a fully outfitted, eight-day camping, kayaking, stand up paddle boarding, surfing and hiking adventure. 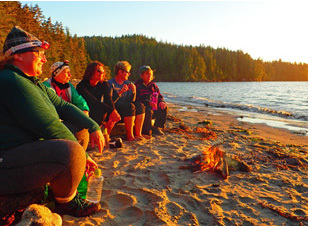 The $2,895 CAD per person rate includes services of two female guides, three nights camping, four nights inn accommodation, all meals, ground transportation, scheduled activities (and all gear), half-day surfing and paddling lessons, four-day sea kayak expedition to Vargas Island in Clayoquot Sound and guided coastal hikes. Guests meet at Tofino Ecolodge on Vancouver Island, accessed by ferry or air shuttle from Victoria or Nanaimo, BC. From here the Wild Pacific Trail and the Pacific Ocean become both playgrounds and challenges, as does a three-night camping/four-day backcountry kayaking trip to experience the old growth forests and First Nation spirits of Clayoquot Sound, a UNESCO Biosphere Reserve off the west coast of Vancouver Island (http://wildwomenexpeditions.com/trips/vancouver-island/). Founded in 1991, Wild Women Expeditions is one of the world’s largest women-only travel companies. Its initial focus was on canoeing on remote Ontario waters. Through an unwavering focus on Canada, one of the wildest, most pristine countries in the world, Wild Women Expeditions became Canadian experts in a pioneering niche that introduced small groups of women into wilderness settings. Even though the company now hosts guests all over the world, it retains a national focus with more trips and more women-only, backcountry camping adventures in Canada than any other women’s travel company. CORNER BROOK, NL, CANADA – Wild Women Expeditions, already offering more active travel departures for women only, including the most women-only adventures on horseback, than any other tour company in the world, is featuring five departures for a horseback adventure into Mongolia in 2018. 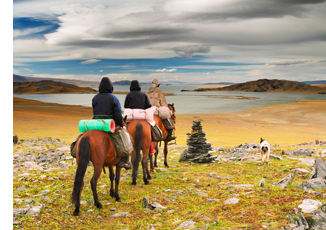 The Orkhon Valley Horseback Adventure, a 14-day itinerary into Mongolia is priced at $2,295 per person; however, because the program is so popular, only June 3-16 and Aug. 12-25 departures still have space available. In the 12th and 13th centuries, Genghis Kahn reigned supreme here, gathering horses and men sufficient to create the Mongol empire that extended far beyond the borders of present-day Mongolia. A violent world was punctuated by the silence and peace of Tibetan temples, a dichotomy still to be sensed while visiting national parks and settling into yurts in the Orkhon Valley, the summer camp of nomads and today a UNESCO World Heritage Site. A homestay family shares the life of nomadic breeders: milking the animals, preparing dairy products, cutting wood, playing with children and living in yurts. As most honored guests, visitors assist in preparing a Mongolian barbecue that features a goat or sheep slaughtered for the occasion. As landscapes shift from forests to grassy plains to desert and sand dunes, riders explore assorted ecologies of the lush Orkhon Valley, mountains, steppes and waterfalls, as well as the mini Gobi Desert. “Here where wild meets wild, you feel the contradictions of this place taking root within you. It brings to life the quiet, contemplative space in your heart – the glorious scenery, and sacred temples inviting you to seek inward. But what you find inside isn’t still, but rather vibrant and loud. As you cross large swaths of black lava, you feel your own inner rumblings, as alive as the volcanic earth upon which you ride. Someone has come upon their trusty steed to save you. And it is you,” added Haddow. In advance of venturing on horseback into the wilderness, guests spend arrival day and evening in Ulaanbaatar, the capital, visiting the country’s most important museum and listening to khoomi (also known as Tuvan throat singing), a vocal technique that elevates the human voice to an other-worldly instrument unique to this region. Wild Women Expeditions tours also offers a window into “some inspiring community development initiatives, such as visiting the Mongolian Quilting Centre. This is a non-profit association, whose purpose is to give unemployed and poor women, originally taken away from prostitution, and instead learn sewing skills to generate income for their families,” she said. Another Wild Women Expeditions trip in Mongolia, Marvels of Mongolia, offers 14 days at $2,895 per person, mixing trekking with camel and horseback riding across grasslands and villages that may well owe their existence to the comings and goings of the fearless Genghis Kahn as he carved out what we know today as the Silk Road.